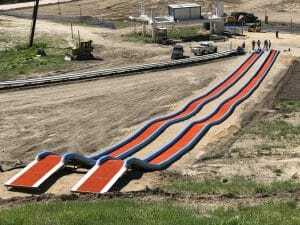 Bogus Basin installed a pair of exciting 300-foot mSnow Bumper Tubing Lanes for the summer of 2017. They carefully prepared the site, complete with walk path to and from a conveyor lift. They installed and graded free-draining gravel before setting the lanes. Through grading, they were able to create a super fun drop in and a pair of fun rollers!